Fits DeWalt impact drivers. Angled pocket for better driver balance. Securing strap with quick release buckle. Fits belts 2-1/4-inch wide. 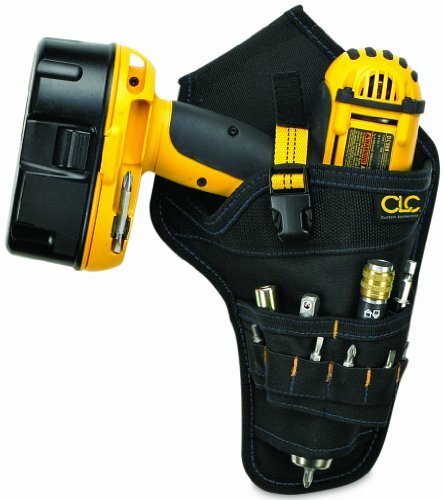 ADJUSTABLE IMPACT DRIVER: This CLC impact driver holster has an adjustable strap and quick release buckle to hold drill securely in place. DURABLE IMPACT DRIVER HOLSTER: Ballistic poly material provides strength and durability for this impact driver holster. 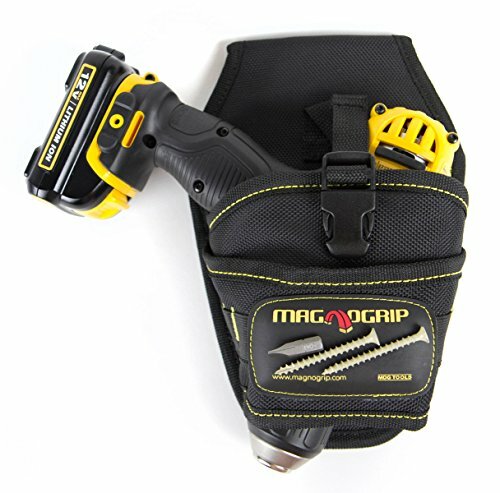 KEEP IMPACT DRIVER SECURE: The hook and loop back on this impact driver holster keeps strap back when not in use. ADDTITONAL STORAGE: This Custom Leathercraft impact drive holster features added pockets and elastic loop hold bits, chuck key, drivers etc. 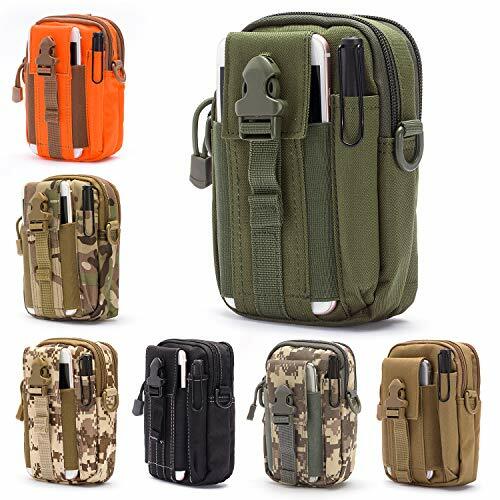 The cell phone, tool, and accessory holder you can hang, strap, or clip on workbelts, web suspenders, pants, etc. Holds most brands of compact cell phones. 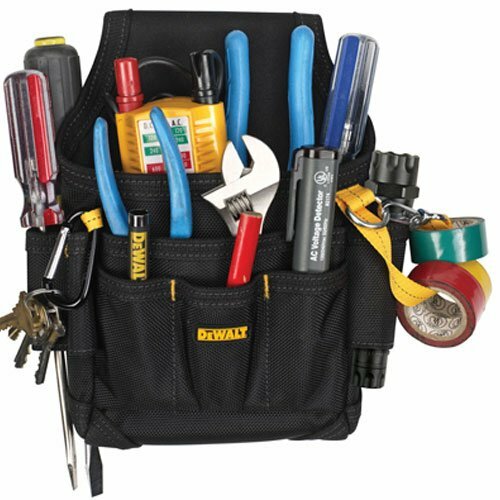 Securely holds small tools and accessories like pliers, mini-flashlights, screwdrivers, and multi-tools. Versatile 3-way attachment for pants, web suspenders, work aprons, and more. 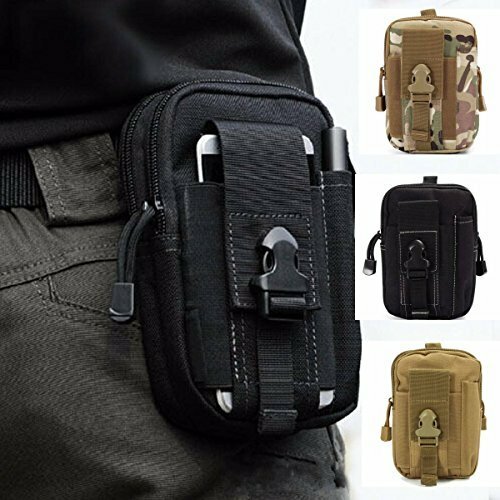 EVERYTHING YOU NEED: With this cell phone, tool, and accessory holder you can hang, strap, or clip on work belts, web suspenders, pants, etc. VERSATILE TOOL HOLDER: This cell phone holder and tool holder 3-way attachment for pants, web suspenders, work aprons, and more. TOOL HOLDER DIMENSIONS: 6 in. x 2.5 in. Ballistic poly fabric includes reinforced edges for extra wear. The pouch has a large main pocket and smaller front pocket for convenient access to parts or tools. 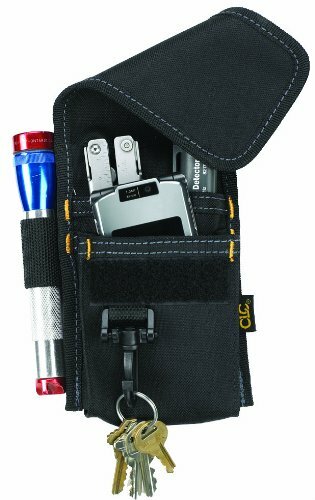 Web loops and sleeve pockets provide multiple storage options, handy flashlight or large tool sleeve, Electrical tape strap plus carabineer for keys. Rear clip or attach to belt up to 2-3/4" wide. Our deluxe cordless drill holster is angled for better balance, has a safety strap with a quick release buckle, and features multiple pockets and sleeves to organize your bits and accessories. EASY ACCESS TO DRILL: This drill holster has a safety strap with quick-release buckle for easy access to your tools. 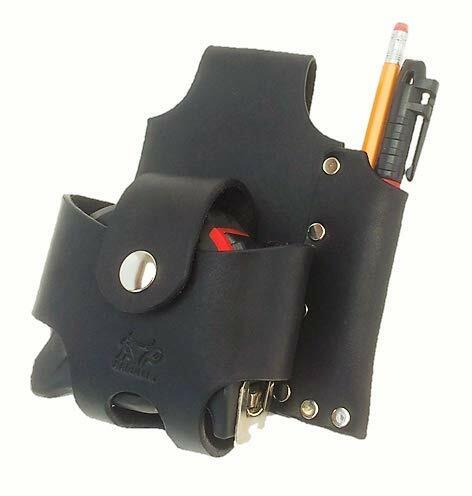 DURABLE DRILL HOLSTER: This Custom Leathercraft drill holster is made of polyester material for added durability. 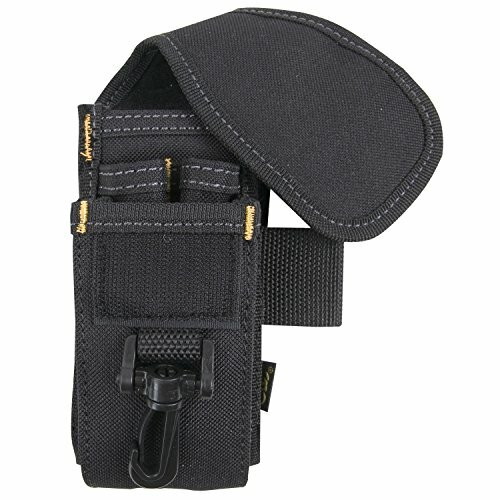 STAY ORGANIZED: This drill holster contains multiple outer pockets and sleeves for complete bit organization. CONVENIENT: Hook-and-loop backing help to keep strap back when drill holster is not in use. ANGLED FOR BETTER BALANCE: This drill holster holds most brands of T-handle drills. 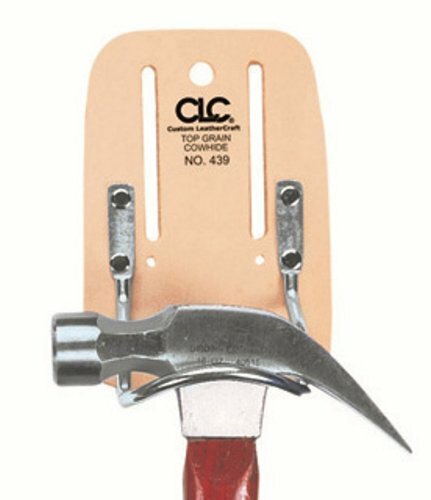 A superior quality hammer holder with a riveted, cradle-style steel loop. Side View. Fits 2.25 Wide Duty Belt. 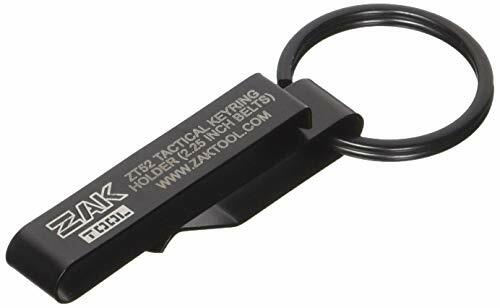 ZAK Tool products are designed especially for Police and Fire agencies. Made in the U.S.A. of the highest quality materials, our products are built to last. Imagine having your drill right at your side whenever you need it...with no more bending down to pick it up. Wearing this holster will help you turn down the volume on your back aches. 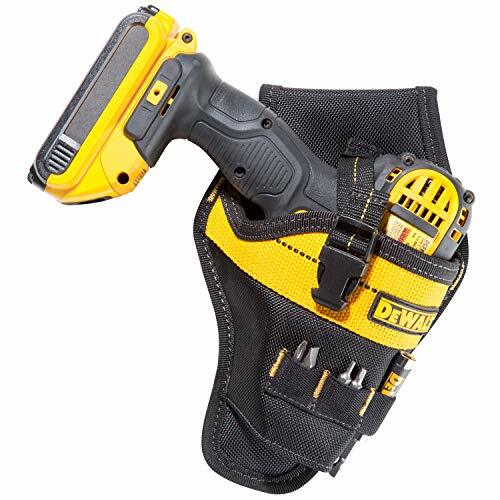 Your drill sits balanced in the angled holster and right at your fingertips. Plus, the open-bottom design, velcro-backed safety strap, and fitted shape make it so your drill goes in and out without a hitch... even with the bit installed. If you spend time on roofs, ladders, or scaffolding, you'll get extra security and peace of mind. With your drill in the holster, you'll be able to climb ladders with both hands free. 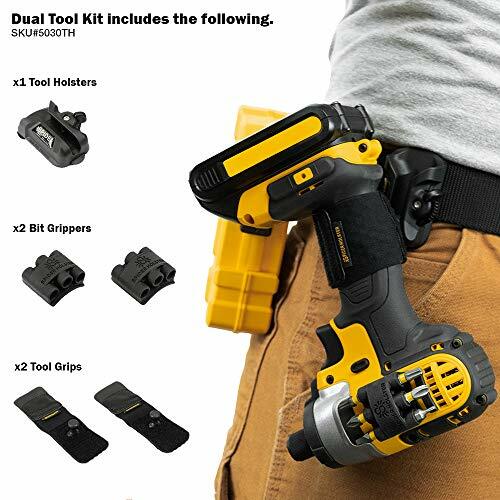 Electricians, roofers, drywall installers, and even home DIYers can benefit from this drill holster. It's made from rugged yet lightweight 600D water-resistant ballistic canvas, capable of withstanding a whopping 25,600 cycles during an abrasion test. And all the seams are double stitched so they don't fall apart when you load up the holster with your drill, tools, and bits. Imagine having holster accessory pockets that are the right size to actually use. There are 8 closed pockets for holding screws and small parts. 5 elastic pockets with closed bottoms to give you quick access to your drill bits. And 4 open loops that let you hang your screwdrivers, allen keys, socket wrenches, and more. We try to treat our customers the same way we'd treat our mom...on her birthday, no less. If you're not 100% satisfied with your drill holster, we'll make it right. That means you'll get a free replacement or a quick and courteous refund. If you feel ready, order your NoCry Fast Draw Drill Holster now. PRACTICAL. Fitted and balanced angled holster design with an open bottom holds your drill or driver securely while allowing it to go in and out without a hitch; 7 inch safety strap with plastic clip buckle fits even large drills and is velcro-backed to stay out of the way while you're working. HANGS ON YOUR FAVORITE BELT. 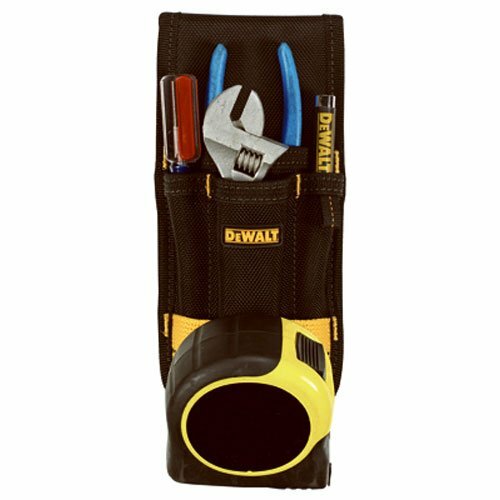 This drill holder has an opening on the back to attach to your belt, padded belt, or tool belt up to 3 inches wide; comfortable to wear even when carrying a heavy-duty impact driver or a cordless rotary tool. Designed to be worn on your right hip. SAVES YOUR BACK. No more bending down to pick up your drill; snug fit to keep your T-handle cordless power drill, hammer drill, impact wrench, or power screwdriver close at hand for when you need it; frees your hands so you can move with confidence and safety on ladders, roofs, and scaffolding. FOR PEOPLE WHO MAKE THINGS HAPPEN. 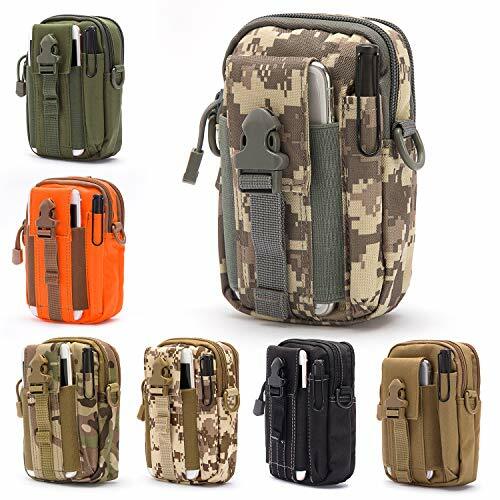 8 closed pockets hold screws, nails, drill extension rods and other small parts; 5 elastic pockets with closed bottoms for quick access to drill bits; 4 open loops for hanging pliers, screwdrivers, wire cutters, and more; 600D ballistic canvas construction double stitched for durability. NOCRY NO HASSLE GUARANTEE. If you're not completely satisfied with your heavy duty drill holster, we'll make it right by replacing it or giving you a polite and quick refund - without needing to send yours back. PLACES FOR ADDITIONAL ACCESSORIES: Steel measuring tape clip, webbing loop, and a loop to hang keys on. 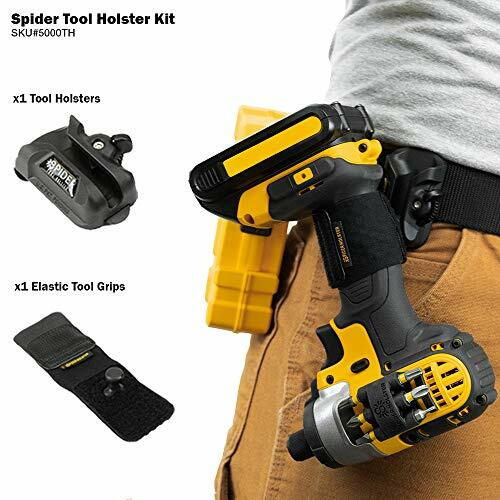 Spider Tool Holster is designed to change the way you carry your power tools, no more setting your tool down or trusting it to a tool pouch. Clip the Holster to any belt, secure the Elastic Tool Grip to your tool and slide it into the locking holster and you're ready to go! Don't set your tools down! Always have access to your favorite tool right at your hip! EASY TO ATTACH: Holster easily clips on to any regular belt or tool belt and allow freedom of movement without allowing excessive tool movement. UNIVERSAL FIT: BitGrippers adhere to any power drill / driver, and Tool Grips stretch to fit any tool handle! HEAVY DUTY: Tool Holster's nylon compositite and high tensile steel construction stand up to rough every day use. INCLUDES: Includes 1 Tool Holster, 2 BitGrippers, 2 Tool Grips. 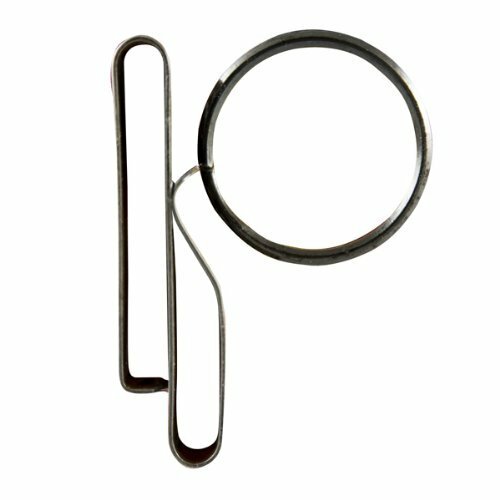 ATTACHES TO ANYTHING: Versatile three way attachment for pants, web suspenders, work aprons, etc. No more headaches from losing or dropping screws, nails, bolts, washers, pins, needles, drill bits, fasteners, and small tools. Unique product design, the details of the deal are reflected in fashion and quality of the perfect combination. 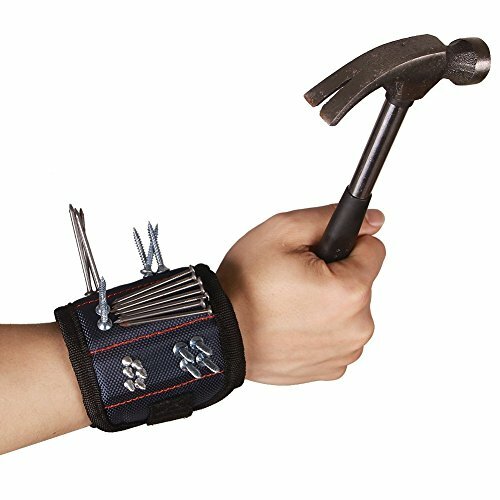 This top notch tools holder magnetic wristband features 15 powerful magnets that can securely hold 144 half inch nails, or 68 two inch nails, or 100 medium wood screws even 50 large wood screws. Magnetic Wristband, can be adjusted to fit any wrist, unisex design that will suit both men and women. One-size-fits-most professional grade piece of equipment that will make the jobs you have to get done. Whether you've been tasked with an important construction project, a DIY home improvement job, or a simple fix-it project around the house, it is the perfect third helping hand to complement your hard working style. Enhanced Edition Embedded with " 15 " super strong magnets, surround almost entire wrist,With two small pockets, plastic parts are placed. 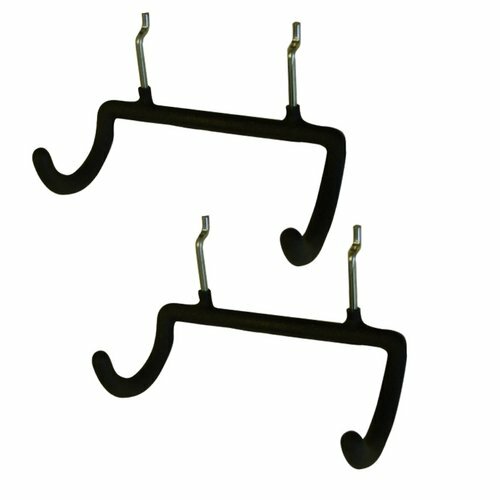 perfect for holding nails, drill bits, fasteners, bobby pins, bolts, washers, pins,wrenches and small tools,much more. Comfortable and Long-lasting Made of durable 1680D ballistic polyester, along with breathable padded mesh inner layer, provide the rapeutic relief to your wrist.The breathable mesh and lightweight design allows maximum comforts for the whole working day. 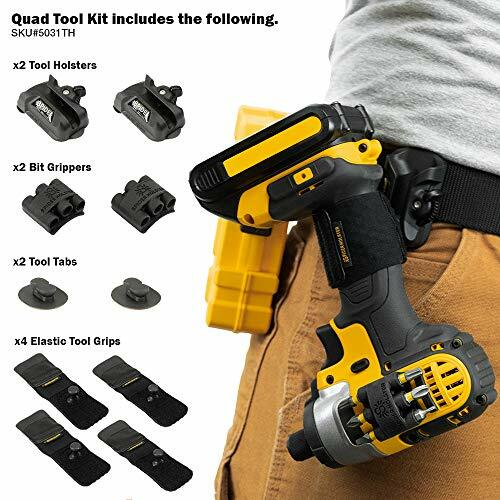 Lightweight and Convenient Ideal for many woodworking, home improvement, and do-it yourself projects,An extremely good helper like your third hand. Greatly help you hold all the small metal objects. No worries from searching for small parts in the toolbox or your pockets, fully improving your work efficiency. HAVE TIRED OF THOSE HEAVY TOOL BOXES? Yeah, it is inconvenient to carry especially climb wooden ladders. This magnetic wristband is lightweight and portable. Less than 70g, it is a Ideal for many woodworking, home improvement and DIY projects. UNIQUE GIFT Perfect home improvement and toolbox accessory.Unique Xmas Gift Toolband for husband, father ,boyfriend, guys,roofers,construction,mechanics,DIY-er, do-It Yourselfer and just about anyone. Product Features: BREATHABLE AND LIGHTWEIGHT The Magnetic Wristband is made of durable, lightweight, and premium 100% nylon fabric with a soft, breathable padded mesh inner layer. ONE SIZE FITS MOST Our magnetic wristband wrist strap is adjustable to fit almost all wrist sizes. Great for both men and women. 6 STRONG EFFICIENTLY PLACED MAGNETS The Magnetic Wristband contains 6 strong magnets that are efficiently placed throughout the wristband to cover almost the entire wrist. Do not be fooled by other brands. Product Size: 9cm (W)*36cm (L) PACKAGE INCLUDES: 1 x Magnetic Wristband SHIPMENT 1.The normal arrival time of Fulfilled by Amazon is between 1-3 days 2.The normal arrival time of Dispatched from Seller is between 10-15 days 3.Holiday Season maybe longer than normal delivery. PERFECT MUST HAVE GIFT for Birthdays, Christmas, and other Holidays for any DIY, handyman, father, boyfriend, men, or women. You won't know you need magnetic wristbands until you have one! 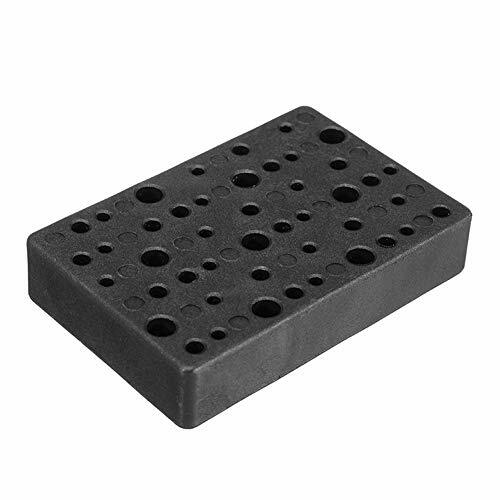 Exterior magnet for holding drill bits, screws and fasteners. Made of durable 1680D ballistic polyester. SECURE: Carry Tools Up to 8lbs. with ease! The RAK Magnetic Wristband contains 10 strong magnets that are efficiently placed throughout the wristband to cover almost the entire wrist. Do not be fooled by other brands. Magnetic wrist straps are designed for small items such as nails, screws, drills, nuts, bolts and fasteners. Stay away from pacemakers and other magnetically sensitive devices. If you are not satisfied for any reason, you have a full year to return the item, no questions asked. SPECIAL MAGNETIC : 6STRONG MAGNETS embedded in each wristband surround almost entire wrist for holding screws, nails, bolts, washers, drill bits. Won't fall off the wristband unless you take them off. ADVANCED DESIGN : Made of 100% 1680D ballistic Polyester, Lightweight , Durable , practical and water-resistant to be used under any work environment. 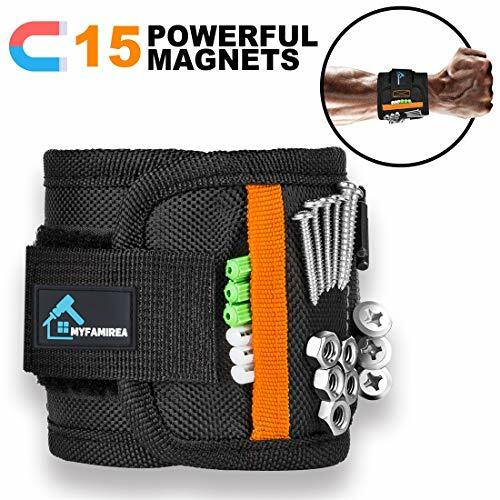 ONE SIZE FITS MOST :Super strong magnets embedded wristband for holding screws, nails, bolts and small tools.can be adjusted to fit any wrist, unisex design that will suit both men and women. One-size-fits-most professional grade piece of equipment that will make the jobs you have to get done. PERFECT GIFT &THREE YEARS QUALITY WARRANTY &FAST DELIBERY: DIY'rs, Car & Motorcycle Enthusiasts, electricians, roofers, contruction workers, and much more will benefit from this product.Especially if they make work easier and more fun!We are confident with our MAGNETIC WRISTBAND, if you are not satisfied with our product within three years, you will get a full refund with no question asked. Ship by AMAZON, you will receive our tool belft 1-3 days, no need worry about the gift delay. Carry up to 6 Drill Bits directly on your power drill for ultimate convenience. Magnetic wristband - When you try to repair something on a ladder, you hold a small tool in your hand. These gadgets may fall from your hands. Or you can put them in your pocket, but it's still inconvenient and time consuming to find the tools you need. Now is the time to find a right assistant for you! Losing or dropping small items at work is no longer a headache. Radio drill sleeves - Suitable for most T-type cordless drills. 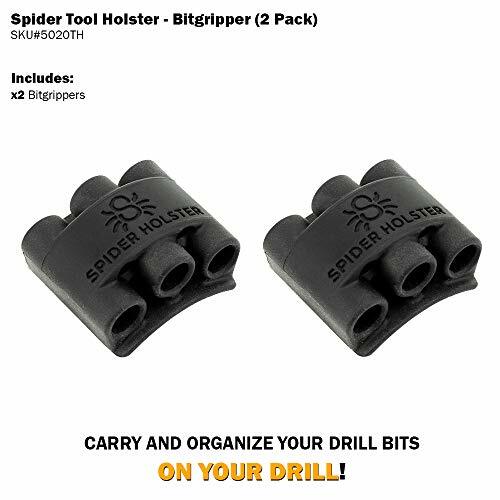 The holster is also equipped with two medium-sized open pockets for storing small wrenches and five small ring pockets for fixing different drill bits. An adjustable waistband fits the waist of anyone. You can carry the tools you need at the same time to save manpower and increase productivity. The perfect combination magnetic wristbands and electric drill holsters will be the best friends and assistants in your work, they will make your work as easy as possible. Single size: Adjustable Velcro wristband for wrists of all sizes. Don't worry about sliding - the Velcro strap secures the magnetic wrist strap in place. Due to manual measurements, please allow 1-2 cm error. 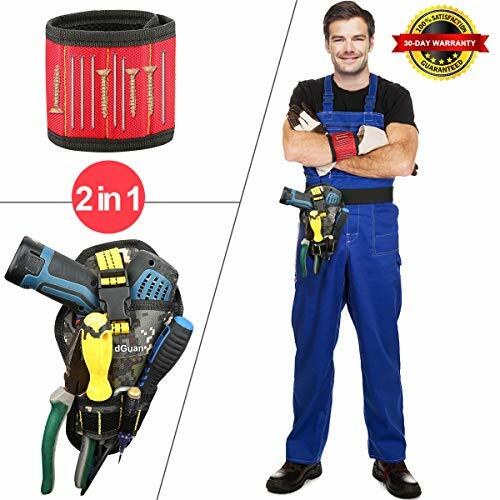 2-PIECE SET OF PERFECT GIFT: A magnetic wristband and an electric drill holster Two-in-one combination set, saving you a lot of time by providing third-hand help when you need it most. Losing or discarding small items at work is no longer a headache, making it easy to get the job done. For any DIY handyman, father, boyfriend, man or woman, it is the perfect birthday, Christmas and other holiday gifts. MAGNETIC WRISTBAND: Built-in 10 super magnets, Adsorbable hold fixing screws, nails, small metal objects, and small tools. This magnetic wristband is ideal for home improvement, construction, woodworking, car repair, sewing and other DIY projects. Velcro ensures that the wristband can be fully adjusted To adapt to the wrist of all sizes. HIGH QUALITY MATERIALS: The magnetic wristband is made of 1680D bulletproof polyester fiber material, which is light in weight and durable. The portable electric drill holster is made of 600D oxford fabric and is double-layered and durable. It comes with multiple outer pockets and small pockets for easy carrying. MONEY BACK GUARANTEE We strive to provide our customers with the highest quality products and the best quality service. If for any reason our product is not suitable for you, please let us know and we will provide you with a 100% refund. 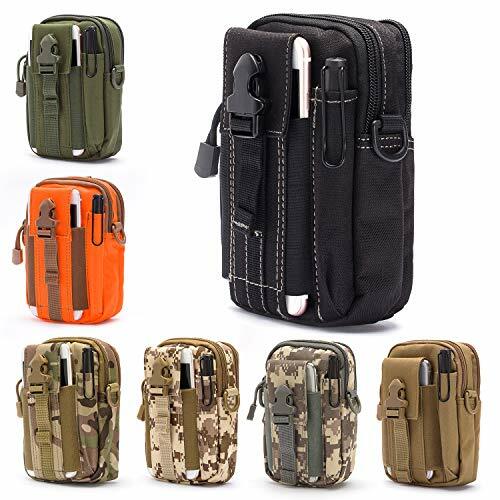 This awesome tactical waist pack is the ultimate utility bag for your next outdoor jaunt across the countryside. 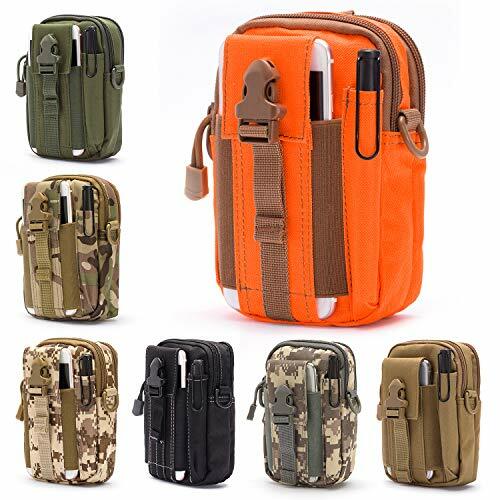 It can either be attached to a belt or a backpack, and has several slots and compartments for all your must-have items. AP Saddlery has been improving the quality of the tool holster market for years now. We are proud to introduce the Mack Daddy of tape measure holsters. Holds most tape measures up to 30' including wide models. Fits belts up to 3" wide. Made using American Hermann Oak leather. Hand made in Louisiana, USA. Hand cut parts, Hand dyed, Hand rubbed edges, sealed with coats of oil to preserve leather. We build our tool holders to outlast any competition on the market. We will always stand by the workmanship and materials of our products. If you have ANY questions we will be glad to help!